The pretty site of La Croix du Vieux Pont has lots to offer. 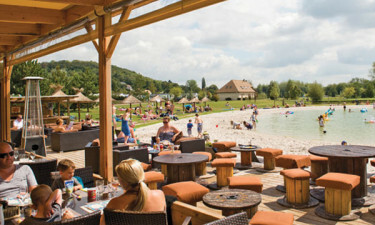 Set on the banks of a river and only a 2-hour drive from Paris, the luxury camping site of La Croix du Vieux Pont has a location that is hard to beat. Onsite there is plenty to keep the whole family happy, with a fun outdoor pool, a sandy beach, a choice of children’s play areas and a large restaurant available. Have a look at the comfortable accommodation on offer when booking with LUX-camp and imagine your family having a fun-filled break away from home. What is special about La Croix du Vieux Pont? 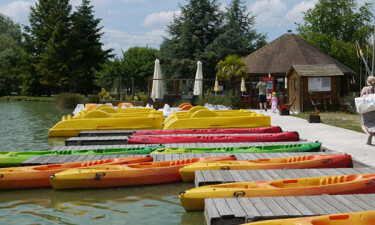 La Croix du Vieux Pont has lots of options for playing in the water from April to October each year. There is a fun outdoor pool area with a hot tub and plenty of sunbathing space around the edge. A retractable roof covers the main pool area, turning it into an indoor pool when the weather turns cool. This holiday camping site has a small lake complete with a beach area of soft sand and tikki umbrellas, and then there is the riverfront where long walks, bike rides and fishing can be enjoyed. For the more active members of the family, there is a long list of things to do on this camping holiday. Table tennis, billiards, table football, tennis, bike riding and mini golf are onsite, and horse riding, boating and a climbing wall are nearby. For those who enjoy fun-filled luxury camping, this site comes highly recommended. It is just an hour and a half to the famous theme park where children can see all their favourite Disney characters. The La Croix du Vieux Pont organise buses on some days, so you can leave your car behind and let someone else do the driving. There is a large, rustic restaurant which overlooks the pool and a fine menu of food is on offer in the evening - so there is no need to cook for yourself on this luxury camping site. During the daytime there is a fast-food place cooking up burgers, pizza and salads to takeaway. For ice-cold drinks there is a bar just by the pool area, creating the ultimate tropical experience. There is a bakery and a small supermarket selling groceries at the entrance to the camp site which is open every day. A mere 15km away, there is a large town where shopping trips with the whole family can be enjoyed. Book with LUX-camp safe in the knowledge that you have chosen camping luxury at its best. Each mobile home comes with everything needed for a relaxing holiday, and every holiday apartment is a comfortable home-from-home.